Where to see manatees in Florida? This is a question that we get asked a lot. To see a manatee in the wild you have to be in the right place at the right time. During the summer months, when the ocean waters are warm, the endangered West Indian Manatee is dispersed throughout the Gulf of Mexico and the southeast Atlantic coast of the United States. But during winter, manatees concentrate in the warm water of Florida’s natural springs and in the discharge canals of power plants. 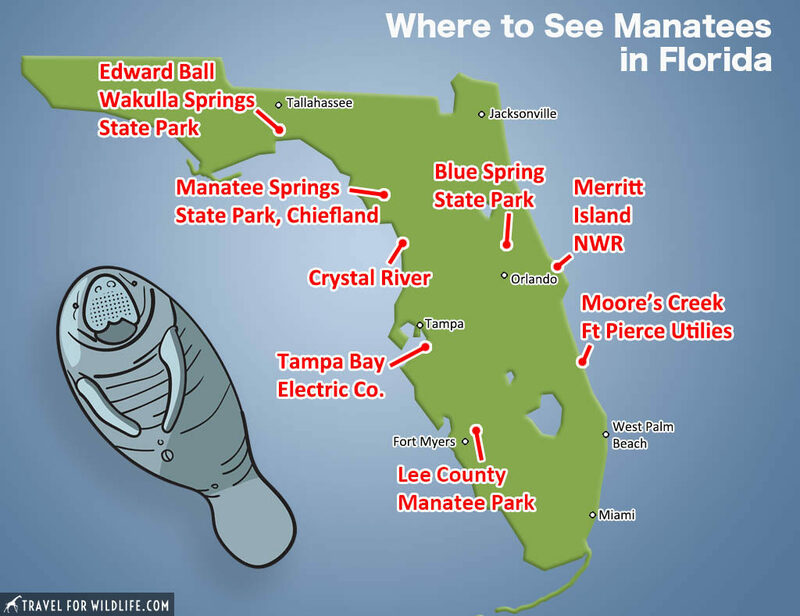 If you visit Florida in December, January, or February, you are guaranteed to see manatees in these strategic locations. 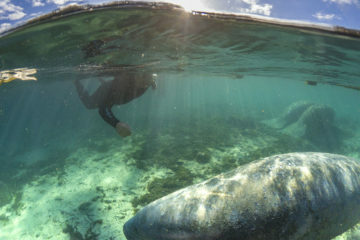 There is one place where you can actually swim with manatees: Citrus County. 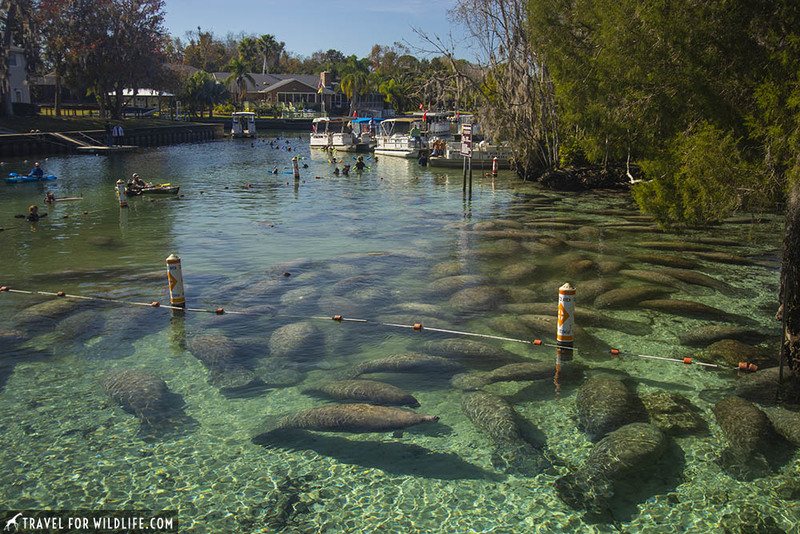 There, in the towns of Crystal River and Homosassa Springs, various tour operators offer manatee snorkeling tours. It is the only place in Florida where you can legally swim and interact with this endangered species. This is our favorite place to see manatees. It is also the only place in the US where you can swim with these amazing creatures. We recommend taking a local manatee tours. If you want to go swimming with manatees on your own, read our How To Swim With Manatees guide. There are also a few locations in Crystal River where you can see manatees from land. Where to see manatees in Crystal River? The most popular spot is the Three Sisters Springs boardwalk. It is also best spot for manatee viewing in Florida. This boardwalk opened in 2013 after the land around the Three Sisters Springs were bought for conservation. The boardwalk is about 1/4 of a mile and it takes the visitor all around the Three Sisters Springs and Idiots Delight Spring (that’s a real name). When the boardwalk ends, a trail starts that takes you yet to another spring, Magnolia Spring. During winter time, manatees are plentiful in all these springs. During manatee season (November 15-March 31), the Three Sisters Springs boardwalk is open every day and it costs $15 per person. 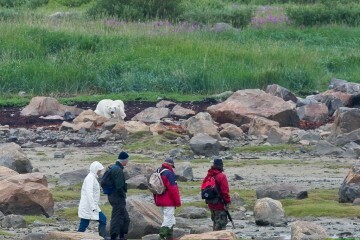 No pets allowed and no parking facilities available. 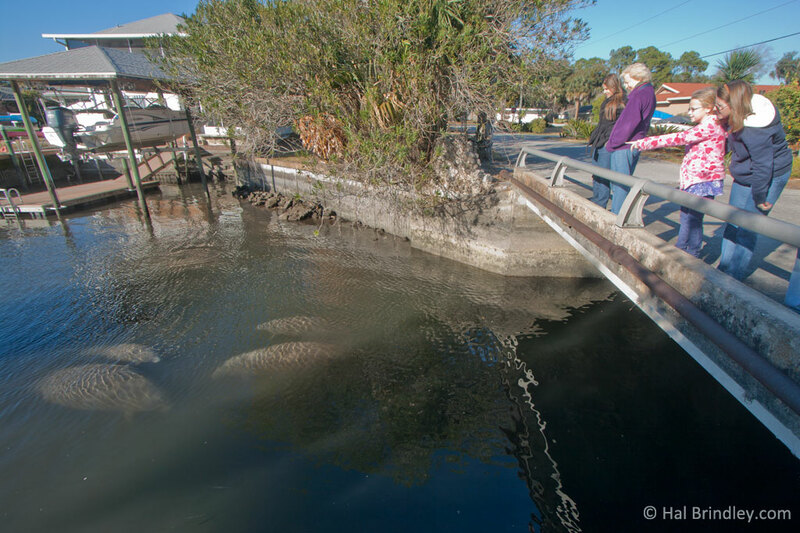 You can also see manatees in Crystal River at the bridge on SW Kings Bay Drive. This bridge overlooks the canal that connects Kings Bay and the Three Sisters Spring, both of which are designated manatee refuges. From the bridge you’ll be able to see manatees traveling to and from the Three Sisters Springs. Watching manatees from a bridge in Crystal River, Florida. There are a couple of spots by the bridge where you can park you car, but always remember that this is a residential area and to respect other people’s property. It is very likely that you’ll have to walk to the bridge for lack of parking spots. As it is a public bridge, there are no time constraints or fees. Covering more than 2,600 acres, Blue Spring State Park is a designated manatee refuge and the waters are closed to swimmers and kayakers during manatee season (mid-November through March). During the summer, swimmers can enjoy the 73 degree constant water temperature, and St. John’s River is very popular for canoeing, fishing and boating. The park is open from 8am until sunset, and there is a fee of $6 per car. Arrive early (especially during weekends) to secure a parking spot, otherwise you won’t be able to enter the park. There are cabins to rent overnight and a full-facility campground. Visit the park website here. Many manatees winter in the discharge canal of the Florida Power and Light plant which empties into the Orange River near Fort Myers. The Lee County Manatee Park was created along this canal to offer superb manatee viewing. There are three viewing platforms to choose from. You can learn more about manatees at the “All About Manatees” free program at 11am and 2pm each day. This Regional Park has also a butterfly garden, picnic areas & shelters, and a fishing pier on the Orange River. The park is open year round from 8am until sunset. Another option is to rent a kayak on the Orange River and search for manatees. 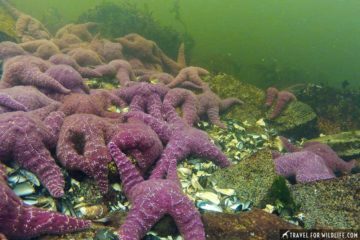 The water here is dark and it is difficult to see them until they surface to breathe but it is an exciting experience nonetheless. Visit Lee County Manatee Park website for more information. 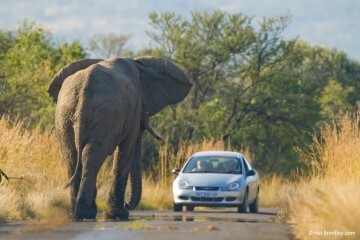 Parking fees apply. For a map of the Manatee Park with interactive views of the amenities and manatee observation areas click here. 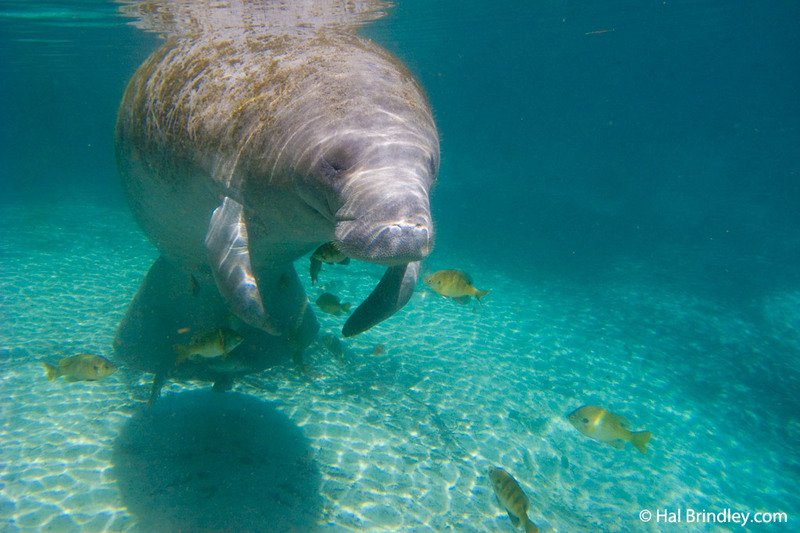 Not just a wintering place for manatees, Merritt Island provides habitat for more than 1,500 different animal species. 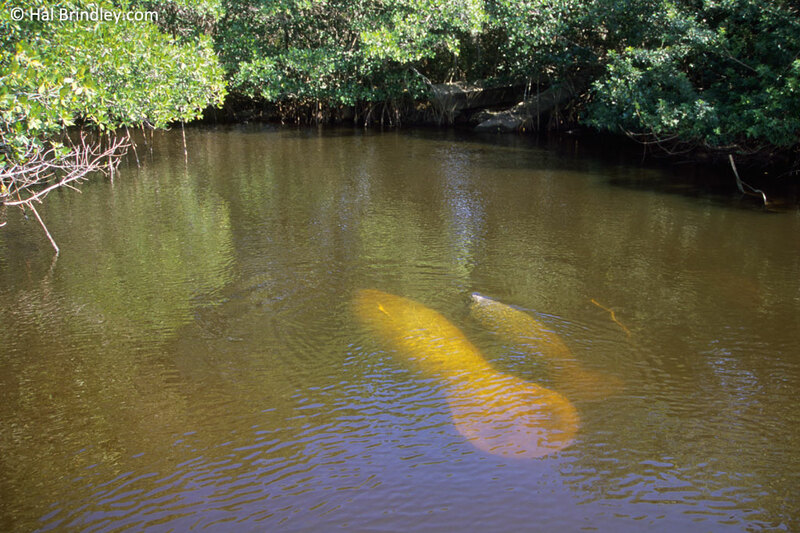 Manatees can be viewed from the manatee observation deck at the Haulover Canal. During manatee season (November-March) the refuge is open from 9 am until 5 pm during weekends and 8:00 am to 4:30 weekdays. 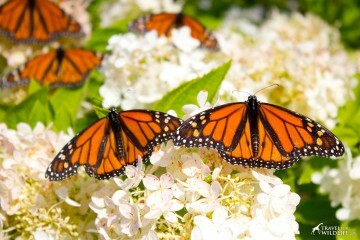 Learn more about the Merritt Island Wildlife Refuge. There is a visitor center, a walkway and an overlook where you can see the manatees in the discharge canal during manatee season. Read more about the Manatee Viewing Center here. 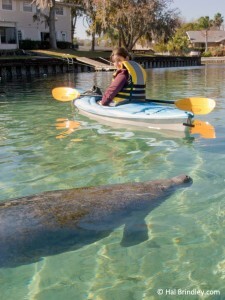 Cristina kayaking with manatees in Florida. Moore’s Creek – Ft. Pierce Utilities Authority: Manatees can be viewed from the Manatee Observation and Education Center. Edward Ball Wakulla Springs State Park – Wakulla Springs: Daily boat tours provide a closer look at wildlife. Entrance and boat fee are required. Manatee Springs State Park – Chiefland: Park entrance fee required. I never had the chance yet to swim with manatees but it looks like an amazing & wonderful experience. Yes it is! Absolutely wonderful and amazing. If you get to swim with them, let us know about your experience! Nachelle, it is only legal to swim with them in Citrus county, so yeah, Crystal River is the place to go. I am traveling in May to Panama City FL. What are the chances of spotting manatees at Wakulla Springs? It seems to be the closest option. Hi April, I am not familiar with Wakulla Springs so I am not really sure. Hope you see some!